Gas leaks – contact National Grid Gas directly on 0800 111 999. No hot water from the heating system (1 October – 30 April). Tap which cannot be turned off. Severe water leak from heating pipe, tank, cistern or toilet. Blocked or leaking drain or sewer (this may be Severn Trent Water’s responsibility). Complete failure of heating system (1 October – 30 April). Blocked flue to heating appliance. Blocked toilet, if there is no other working toilet in your home. Loose and dangerous parts of your property, such as loose roof tiles or unsafe chimney stacks. 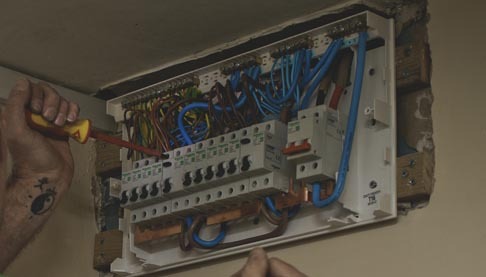 Dangerous exposed electrical wiring, sockets or switches. As much detail about your repair problem as you are able to provide. This will help us to prioritise your repair appropriately. We will attend to an emergency repair where your home is dangerous or insecure. We will get to you as quickly as possible to make sure you and your home are safe, although it is possible we may not be able to complete the repair immediately. If this is the case we will arrange to come back to finish the work. A full list of emergency, urgent, routine and planned maintenance works can be found in our Tenants’ handbook and we also have a How to report a repair leaflet. Both of these are saved in the ‘Library’. I had reason to call the out-of-hours number on a Sunday. I was very impressed with the service as, within the hour, my problem was solved.